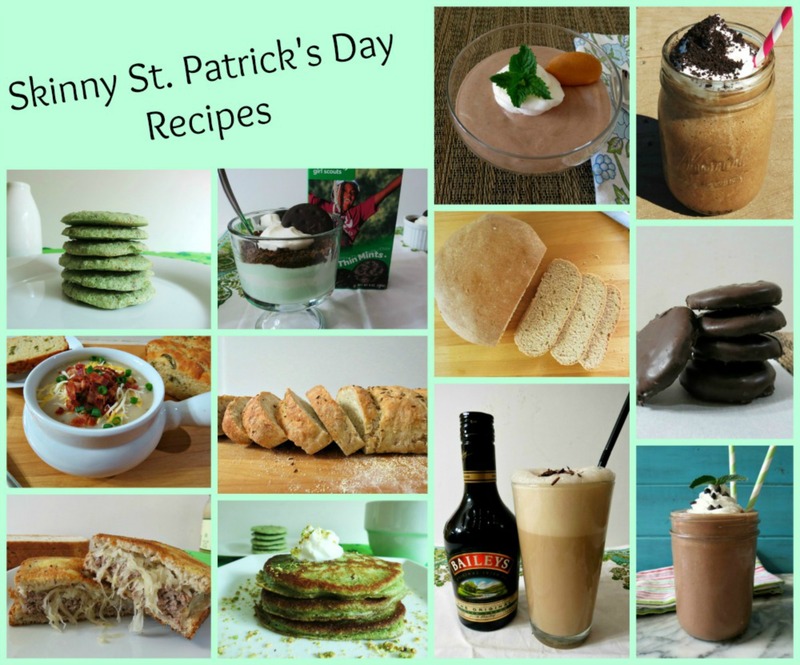 Instead of bringing back one recipe today I thought I would share with you some of my favorite St. Patrick’s Day recipes. When I think of St. Patrick’s Day, I think of corned beef and cabbage, rye bread, and Girl Scout cookies. I just love St. Patty’s Day. When living in Buffalo, this was HUGE celebration. There was green beer, parades, delicious food and just happy people! Weather did not hold them back at all. I do miss those fun days! I have a tiny, tiny part of Irish in me and that gives me a BIG excuse to celebrate. he he So let’s get the St. Patrick’s Day Round up started! First up is my Off the Hook Rye Bread! We just love Rye bread in the house! This is such an easy, delicious recipe! 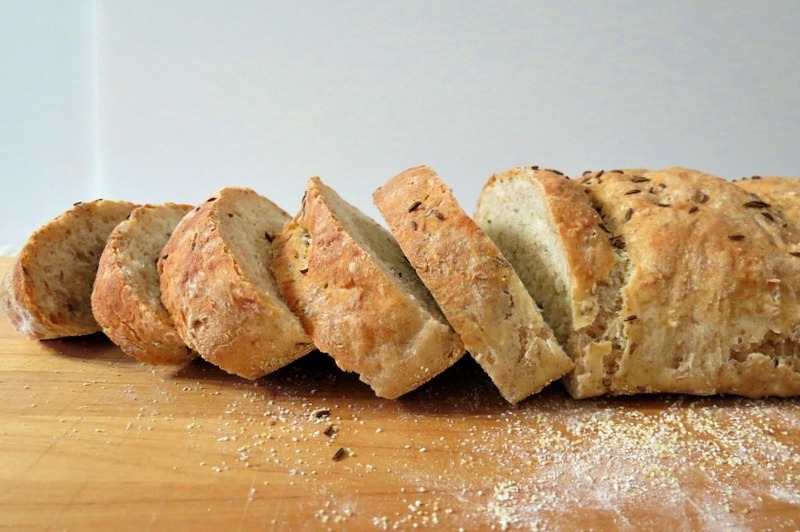 Not into kneading or anything, but still want a light, moist rye bread? 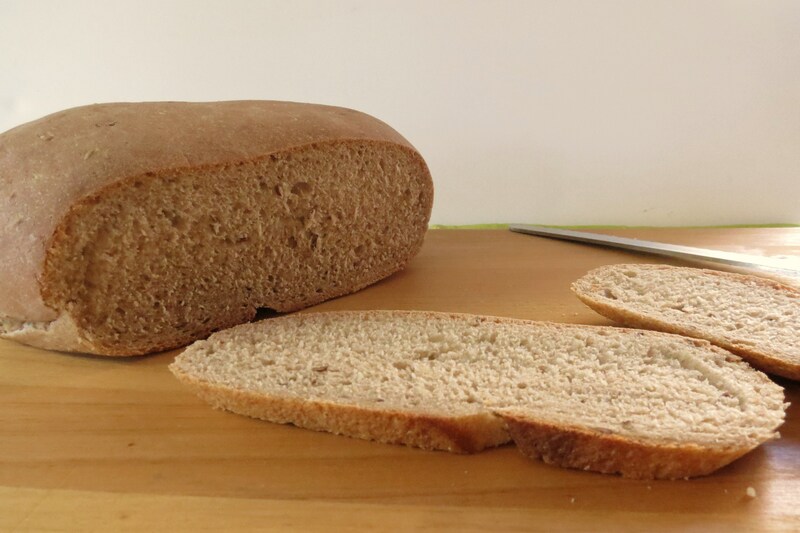 Try my Five Minute a Day NY Deli Rye Bread. I have to say, my Off the Hook Rye Bread is delicious, but the 5 minutes a day NY Deli Rye Bread is amazing! It’s one of my favorites and no work is really required to make it! You should really give it a try! You know what goes great with Rye Bread? An Irish Burger! This burger is crazy good! I remember serving this last year and my family was not impressed, until they took a bite. Even Little Jenny liked it. This is such a great change up to a hamburger. 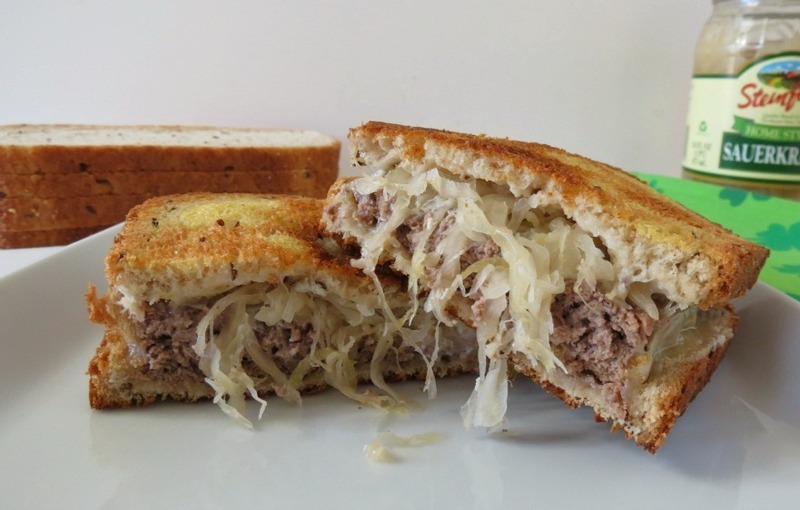 The sauerkraut goes wonderful with it. If your more of a breakfast person, I have some nice light, fluffy pancakes for you! 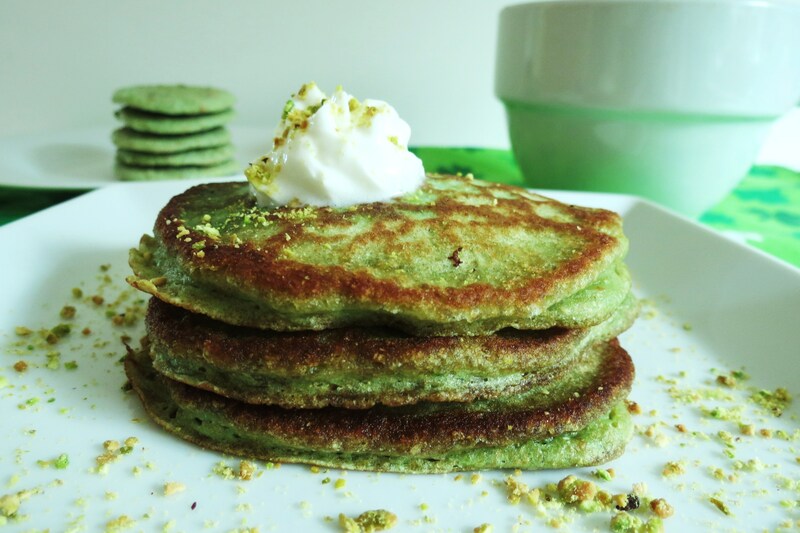 This is my Pistachio Pancakes! These pancakes really surprised me on how delicious they are. 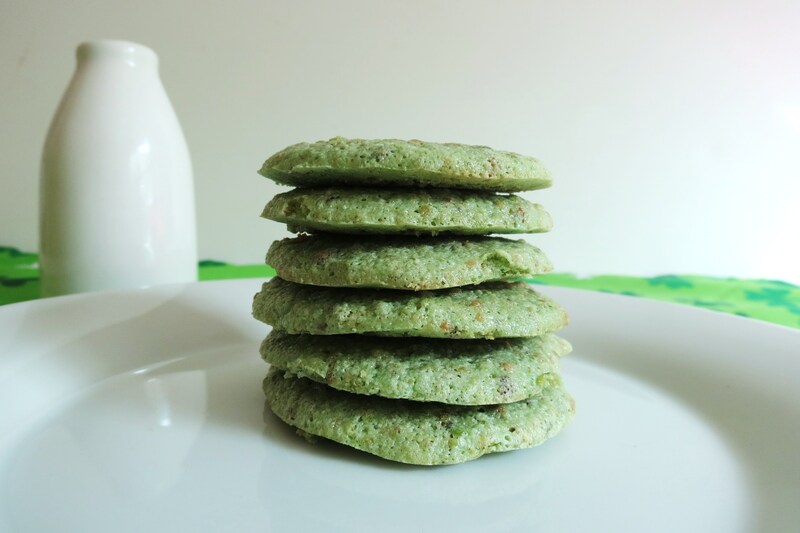 I loved the Pistachio Pancakes so much, that I made Skinny Pistachio Thin cookies! These cookies are light, and have an amazing pistachio flavor. Yum! Now you can’t get buy the St. Patrick’s season without picking up a box of Girl Scout Cookies. My favorite is Thin Mints! However, after finding out that Thin Mints contain trans fat, I decided to make my own. 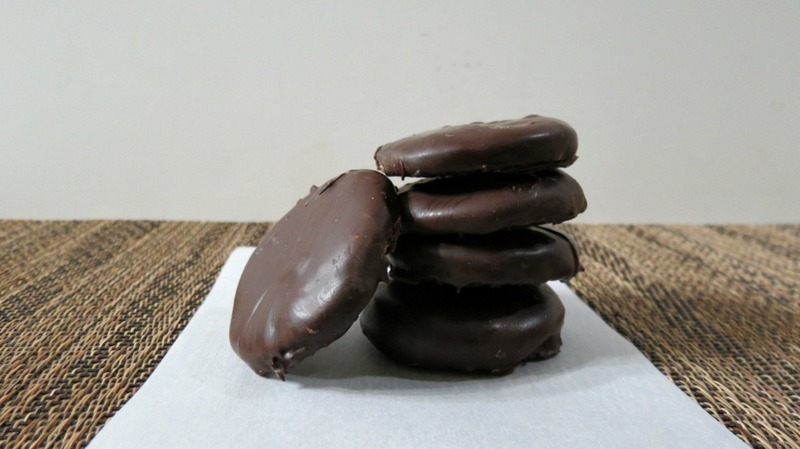 You can not get any closer to a Thin Mint Cookie then with my Thin Mint Cookies! 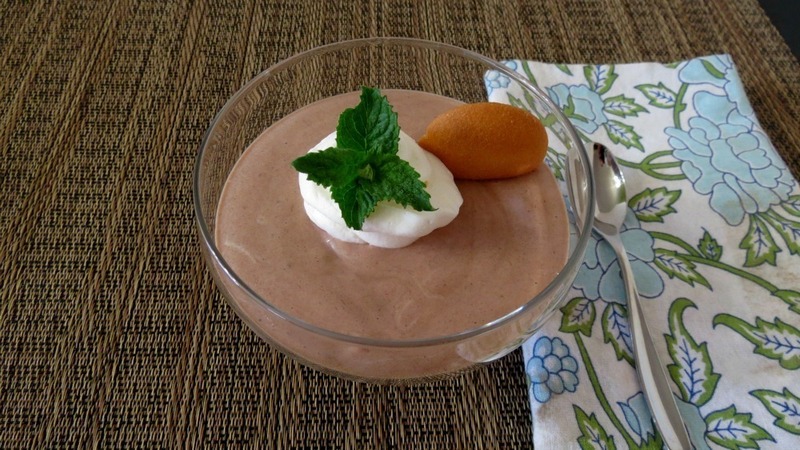 Bailey’s Chocolate Pudding – I totally forgot about this pudding. I don’t know how I could have? 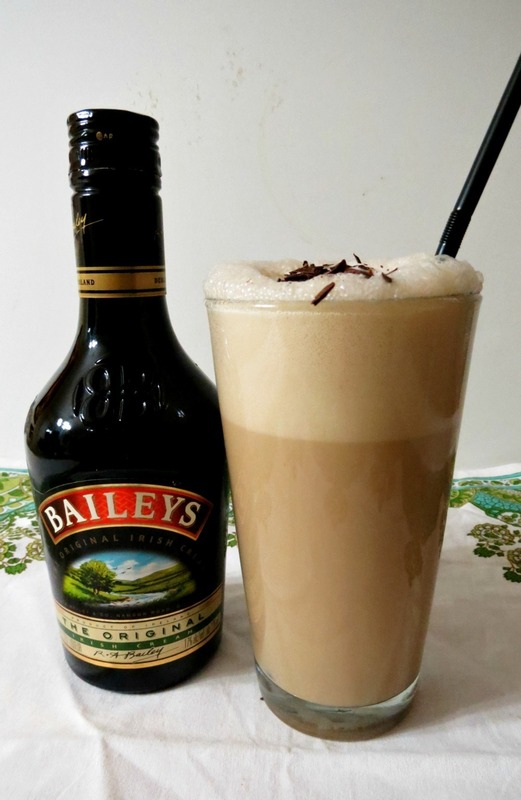 It’s amazing, chocolaty and has the perfect hint of Bailey’s Irish Cream. 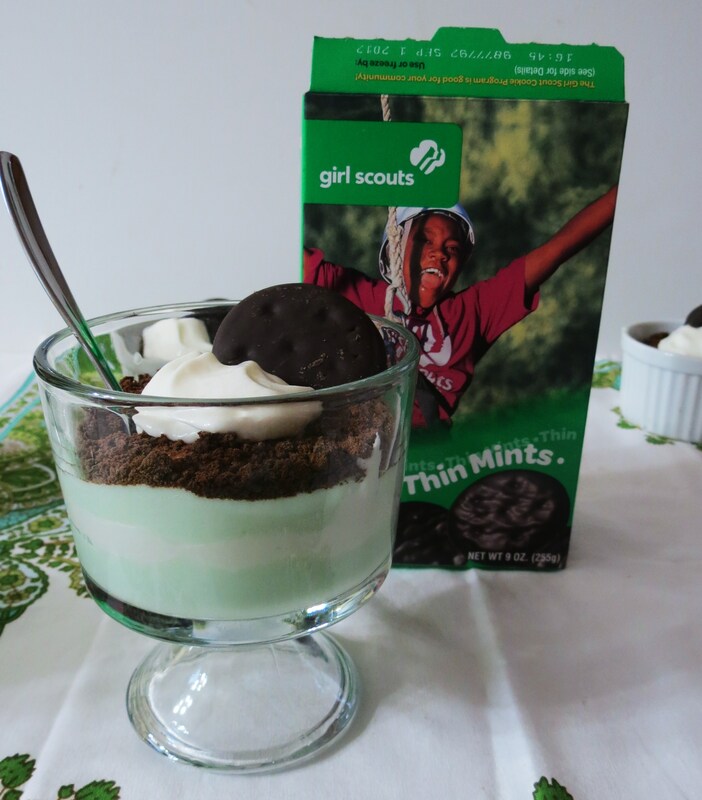 Thin Mint Pudding – Yes I broke down and bought Girl Scout Cookies when making this recipe, but darn it is so good. Creamy, minty and has the perfect cookie topping! You know how I like my drinks! So why not a Bailey’s Irish Cream Milkshake? This is darn good! One of my first recipes on my blog. I so need to remake the photos for it. 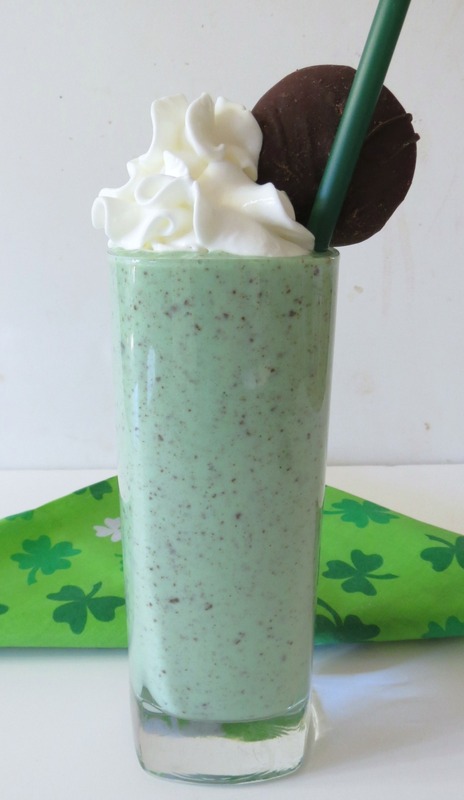 Healthy Shamrock Shake – I love this shake! It’s my version of McDonalds Shamrock Shake. I made it with my homemade Thin Mint Cookies! How about a Mint Chocolate Chip Smoothie? This is so good, creamy, minty and just perfect! 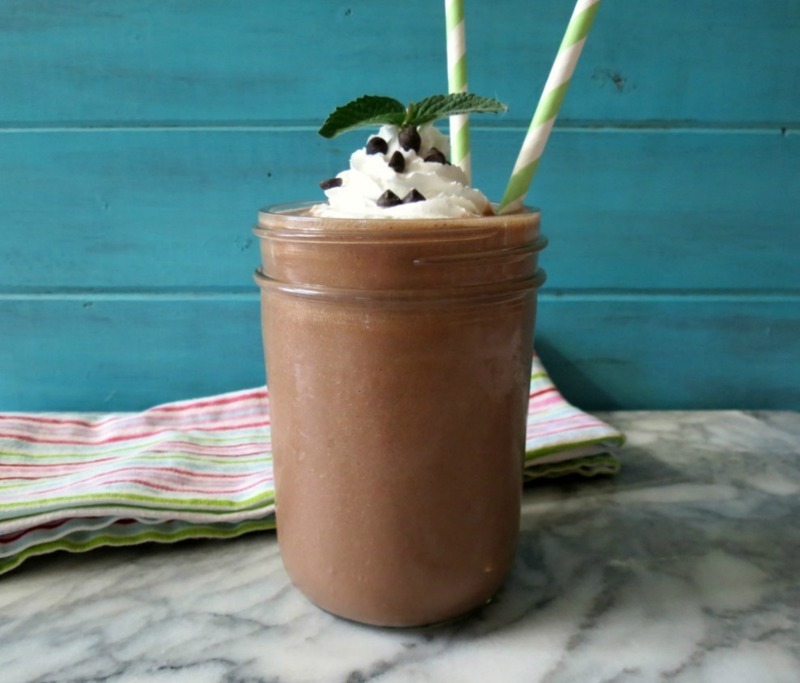 Skinny Mocha Mint Cookie Frappe – Oh I love my frappes and mint, cookie and coffee together! Yes Please! 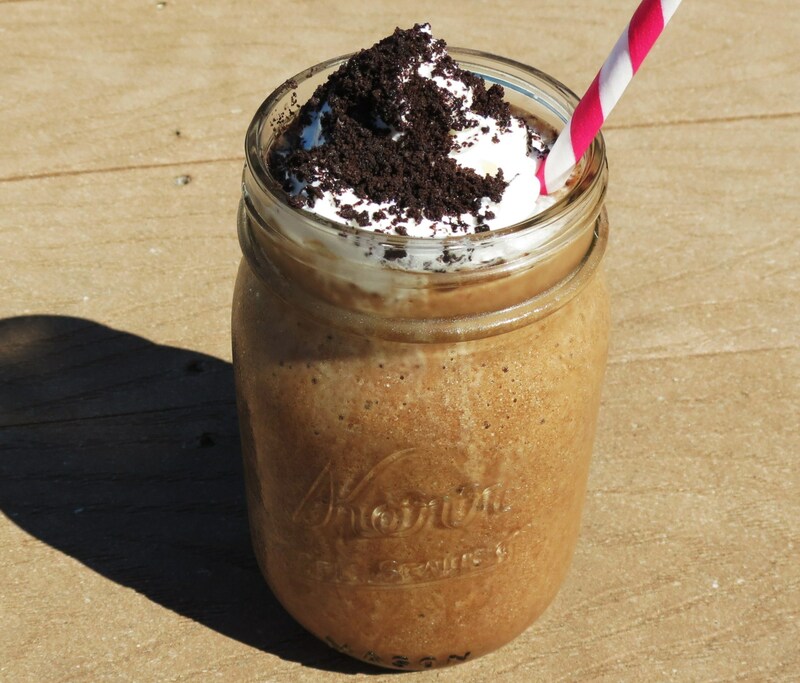 I made this just for little Jenny since she loves Starbucks Cookies and Cream Frappuccino. 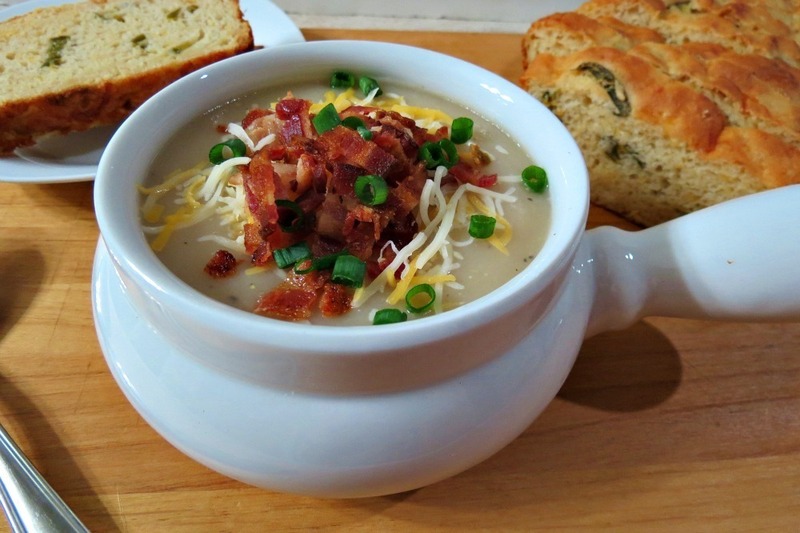 How warming your heart and soul with a big bowl of Homemade Potato Soup? I just love a thick, hearty potato soup! Well that’s it for my St. Patricks day edition! This little round-up gives me some great ideas for this week! I think I’m going to have to try that irish burger at home… looks delicious!!! Sooo many excellent recipes Jennifer! YUM! Thanks Sophia! 🙂 I have to sign p for your e-mails again! I haven’t gotten any? Thank you for the invite! I will pop on over!